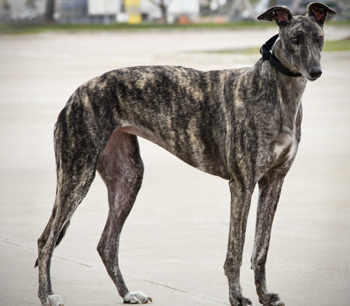 Aspen, aka Killer Aspen, is a 2-year-old light brindle female born on April 24, 2009. Her sire is the late, great Dodgem By Design and her dam is Hilan Anna. She has no races to her credit on Greyhound-data.com. 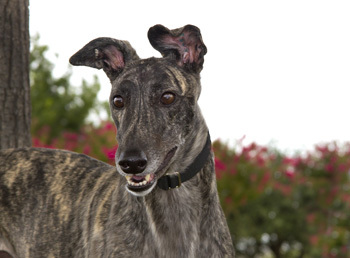 She was found as a stray near Lubbock by A Place For Us Greyhounds. They requested GALT's help with several strays sighted on the same property, including Lemonade. GALT loaned them a live trap to use in Aspen's capture. 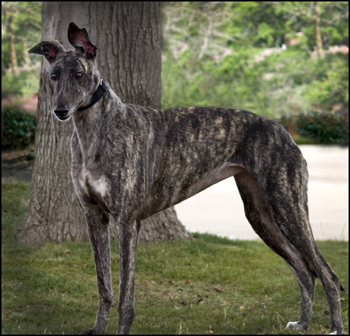 Aspen's bloodwork upon arrival revealed low platelets and Ehrlichia, for which she has been successfully treated. Aspen is not cat tolerant and has not yet been tested with other small animals. She is being treated for corns. Come meet this sweet girl soon! Aspen is a calm, quiet girl who loves to be in the same room with you and has a sensitive soul. She likes tossing her favorite fuzzy toys around, and likes to play with other dogs too. Once playtime is done and it's naptime, you'll often find her roaching (rolled over on her back) when sleeping. While quiet, Aspen does have her moments of excitement as with any two year old! She spins around in a little circle when it's time to eat, and loves to 'trash talk' the other dogs when she's running with them outside. We go outside right after mealtimes so she can do her potty thing, but lately she's also been coming over and staring at me when she needs to go outside. What a good girl! Aspen is a champ at jumping in and out of the car, and walks very nicely on leash. She's a good eater, and loves treats of all kinds. Aspen is not confined to a crate during the day, but does like to nap in one. Aspen is going to be a wonderful companion for her special person, with or without other dogs!